IBSAT 2017 Registration: The ICFAI Business School Aptitude Test in one of top most entrance exam to take admission in MBA/ PGPM (Full Time/ Part Time) courses in IBS Hyderabad or other affiliated institutes. The IBSAT 2017 was conducted by the ICFAI Foundation for Higher Education, Hyderabad. The candidates who are all want to get admission in MBA/ PGPM, have to apply for IBSAT 2017. The application Form is now available in both online and offline mode. For further info, read this article fully. 2. Conducted by: ICFAI Foundation for Higher Education, Hyderabad. Online: you can apply for IBSAT 2017 through ibsindia.org site or else visit the under attached direct link. Offline: the applicants have to purchase the application form through the nearest IBS Marketing Branch or any other designated centre. Applicants must have to complete the graduation degree from any recognized university. In graduation, you should have scored minimum of 55% aggregate marks. Students who appearing in the final year of the bachelor’s degree are also eligible to apply for IBSAT 2017 but they should have complete the bachelor’s degree on or before May 2017. The full details of age restriction is available in the official IBSAT 2017 notification which is attached in our examlevel.com site. If you want to apply for IBSAT 2017 online, then fill the application & submit through online. If you going to apply offline, the purchase the IBSAT application form from any nearest IBS campus and submit it to the under given address. 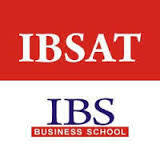 Type: The IBSAT question paper will consist 120 objective type questions along with 5 options for every question. Marking Scheme: For every correct response 1 mark will be awarded. There is NO Negative marks for wrong answer. Duration of Time: The total duration of IBSAT Exam 2017 will be 2 hours. Language: The medium of the IBSAT 2017 question paper will be in English language only. Topics: In IBSAT Exam 2017, the questions were asked from Reading Comprehension, Quantitative Ability, Data Interpretation & Sufficiency and English Usage. Get the IBSAT 2017 application form via online/ offline mode. For online, visit the official website. Enter your valid details for IBSAT registration. Then fill the application form with the requried details. Upload the scanned photo & signature of you. After compeleted the Payment process, submit the application form. Finally, take printout of the application form for further reference. Applicants personal details (Birth Certificate/ Communication/ Caste/ Mail Id/ Phone). Payment details (In case of payment through online mode). Scanned image of colored photograph. The image should be in jpg/ jpeg format with the maximum size of 25 KB (between 140-160 pixels).